Her Universe kicked off when I was starting my summer courses in graduate school for library science. It was also the summer of the 19th FIFA World Cup, so I have to admit that my mind was more into the games than in a newly launched fashion line for fangirls. Though I supported the online shop and its efforts to cater to a variety of fangirls over its first two years, I didn’t own a Her Universe item until the summer of 2013, since for a long time, I didn’t have money. My uncle purchased my first Her Universe item, the Princess Leia hoodie, as a birthday gift. It was on sale at Hot Topic, and although it was somewhat small on me, I had to have it. Luck found me again a few days later and I was offered a job at a college library. After saving up for a few months, I finally placed my first order at HerUniverse.com on November 28, 2013. The order included my Ahsoka Tano Costume Tunic, an Ahsoka’s Choice V-neck for my best friend, and a TARDIS Cardigan for my mom. 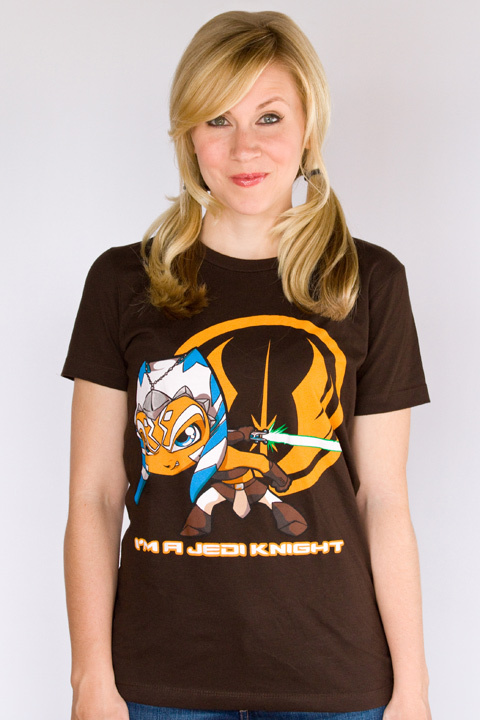 Other orders followed, like my Clone Wars Retro Tee and Fangirl Tunic. I was so happy to finally have the financial stability to purchase geeky items that I decided to share that happiness with close friends. I bought a Course of the Force Women’s Tee for my friend in France, a R2-D2 With Hearts tee for my friend and TWG contributor in New Zealand, two shirts for a pair of sisters in Spain, and many other gifts for fangirls who love Star Wars as much as I do. And that’s what I love most about what Her Universe has done over the past few years. It brought fangirls with shared tastes and preferences together and created one whole community, where fangirls support each other and have a stronger voice in the ever growing world of pop culture. On June 22, 2015, Her Universe will be celebrating its 5th anniversary. Ashley and the Her Universe team will also be re-releasing three designs of its original Star Wars collection. From left to right: Star Wars Burnout Tee, Darth Vader Helmet Tee (ESB Poster), and Star Wars Manga Hoodie. 1:00-2:00 PM EST – Introduction of the Her Universe team and tour of our offices. 3:30-4:00 PM EST – Dessert party with the team’s favorite baked goods. 5:30-6:00 PM EST – Q&A with Ashley. 7:50-8:00 PM EST – “Live” check-in at the Her Universe offices. Looking forward to celebrating with Her Universe and fangirls across social media on June 22. Remember to dream your world, be your world, and flaunt your world. I remember the first time I heard of Her Universe. I was at Dragon Con the year it launched. I saw a booth in the dealer’s room with Star Wars shirts for ladies. I was excited. Finding girls Star Wars stuff at a con is like finding a unicorn. She took me into a curtained off area and helped me try on a shirt. The first one was too small, and I couldn’t pull it off over my head. She helped me pull it off and acted totally professional even though I was only in a bra. I put on a new size and it was perfect. I still have my Ahsoka shirt to this day. Ashley was an absolute sweetheart about the entire ordeal. She was great to have on a panel. It’s one of my favorite Dragon Con memories.